ALUMINIUM USA guarantees a comprehensive overview of the entire aluminium industry. It is the meeting place for suppliers of raw material, semi-finished and finished products, surface treatments and producers of machinery, plant and equipment for aluminium processing and manufacturing. 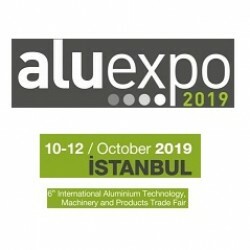 ALUEXPO is the 6th International Aluminium Technology, Machinery and Products Trade Fair that will be held in Istanbul Expo Center from the 10th to the 12th of October 2019. Visit us at booth H10-C120!